I heard Hillary Clinton’s voice for the first time last weekend – yes, days after the surprising and heartbreaking outcome of the 2016 Election. I heard it in Kate McKinnon’s moving rendition of Len Cohen’s Hallelujah on Saturday Night Live. ‘How could this be?’ You might ask. Weren’t we all party to a near continuous stream of voices from both candidates over the past months? Even with all of that volume I was struck with the weight of the words conveyed by McKinnon. It reminded me of the importance of voice, one of transition’s most critical tools. Did we hear Hillary’s voice? Do we hear yours? It is such a simple question. Do we hear your voice? Last week’s events brought me back to voice’s importance and the risk we all face in its absence. Regardless of your party affiliation, we are all now reminded of the necessity of having all of our voices at the table and of the ease with which our voices can be manipulated, misplaced or even muted in our society. Voice – my own and those of the other women in my research – helped me bring structure to a topic that is hiding in plain sight for women, transitions. I’ve observed that the process of transition for many is a process of legitimizing those things that hold value and meaning to them. Women in this camp have allowed external voices to help them conclude that their value and meaning anchors aren’t enough or right or expected or worthwhile or….. The things that hold value or meaning differ for each of us – as in the things that hold value for you will be different from those that hold value for your neighbor. Could transitioning simply be summoning the courage to pursue that singular path – to bring forward – that which is uniquely ours? Pursuing this path can be lonely or enlivening. Truthfully – at least for me – it is both. I wonder if Hillary feels the same? “No one has ever asked about MY voice,” said a young woman with tears in her eyes at an event I facilitated recently. She was from Lawrence, MA, an immigrant mecca about 30 miles from Boston that struggles economically. She shared with us how many have told her ‘what’ she needs to do. To get ahead. To give back to her community. To escape. But voice? How could no one ask? How often do we send a similar message to each other? Clinton’s final message of encouragement and empowerment to all women, especially young women, are important additions to our social dialogue. In my interpretation, her message leads us to the doorstep of voice. May voice serve as a bridge for you to connect others to those things that you care deeply about. May it be present and accounted for at an ever-increasing volume and – despite pressure to the contrary – may it never been interrupted. This Thanksgiving I hope you can take a moment to ask another about their value and meaning anchors. To give the gift of interest. And if you can take one step more – risk bringing yourself forward in the process. 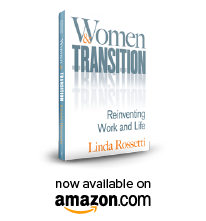 Thanks to the voices of more than fifty readers, the Kindle version of my book, Women & Transition, is featured on Amazon this month. I am convinced that this little victory is an outcome of the solid 5-star rating from readers who were willing to share their opinions via Customer Reviews. Through November Amazon is offering the kindle edition for only 2.99! I’d be grateful if you could pass this information along to your friends and neighbors who might benefit from learning more about voice & its important role in transition. Warmest wishes for a safe and happy Thanksgiving! Take a moment to read my favorite Thanksgiving post from a few years ago. This entry was posted in Observations on Transition and tagged career change, career transition, divorce, empty nests, Hallelujah on SNL, Hillary Clinton, Kate McKinnon, linda rossetti, personal transition, retirement, transition, Women and Transition: Reinventing Work and Life, women's transition. Bookmark the permalink. Wonderful post, Lin and congratulations on the Kindle version of your book being featured on Amazon!